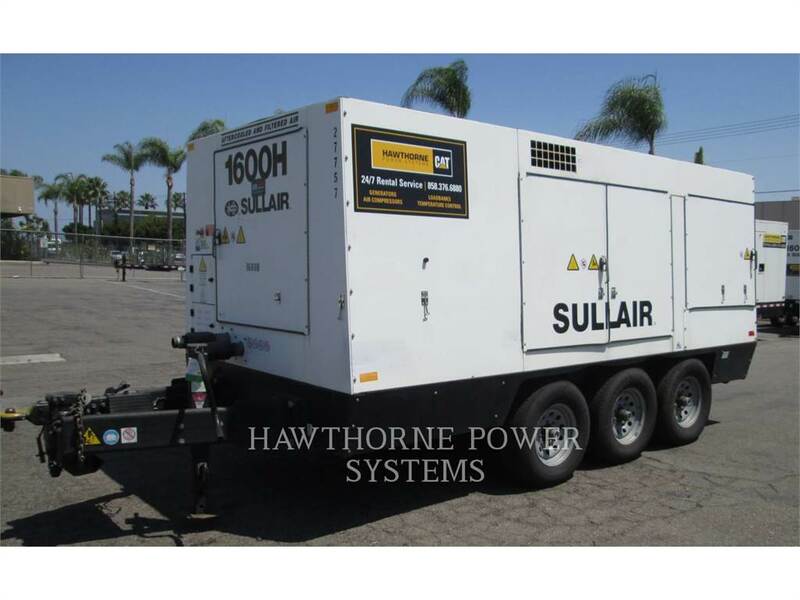 Additional Information CALIFORNIA EX-RENTAL FLEET • 2011 SULLAIR DIESEL POWERED AIR COMPRESSOR • Model 1600HAFDTQ-CA3 • Rated 1600 CFM ... 150 PSI • Aftercooled and Filtered Compressed Air • Instrument Quality Air Per ISO 8573.1:Class 1.7.1 • Rotary Screw Compressor • Aftercooler and Moisture Separator • Primary and Secondary Filtration To 0.01 Micron • COMPASS Controller – Monitors Every Aspect of the Compressor and Engine • Cat C15 EPA Tier 3 CARB Compliant Diesel Engine • 24v Electric Start • Charging Alternator • Batteries-Rack-Cables • Sound Attenuated Enclosure • DTQ 2-Axle Package • 120 Gallon Fuel Tank • 2 Service Valves - 1-2” NPT For Standard Air – 1-2” NPT For Instrument Quality Air • Unit Has Been Regularly Serviced and Maintained By a Cat Dealer Since New With Approx 3775 Hours Showing on Service Meter • Package s/n 2011106210034 • CARB Permit No. 156225, Exp. 9/30/17 • Unit Dims: 20’-0” L • 7’-4” W • 7’-10” H • Approx 16,700 lbs.